1. Install Mirror Moon's English patch (the newest update/fix, without the debug flowchart). 2. Extract "patch~debug_eng.xp3" to your Fate game directory. 3a. If you installed Mirror Moon's patch with voices, rename "patch~debug_eng.xp3" to "patch7.xp3". 3b. If you installed it without voices, rename "patch~debug_eng.xp3" to "patch4.xp3". There is also a simple untranslated patch included, to be used with the original Japanese game. Be sure to use the correct one. You must choose START on the title screen to activate debug mode for the current game session. After this, you can load a saved game. Debug mode consists of two panels, FLOWCHART and FLAGS. These appear as tabs on the edge of the screen, which can be opened by left-click and closed by right-click. It also displays brief pop-up messages whenever a flag is checked or altered during the game. This displays all of the scenes and choices for the current day/route. Yellow boxes are scenes, green boxes are choices, and blue boxes are links to other flowcharts (next day or route change). Scenes that have been viewed (that show the skip message) will have a small checkmark. Clicking a scene once will display information, and double-clicking will jump to that scene. Longer flowcharts can be scrolled by clicking the arrows at the top or bottom. This lists all of the flags that are currently loaded. The game will only load flags when it reaches a day that uses them, or when a saved game is loaded, but they should remain permanently loaded until the game is exited. Flag names starting with "g~" are "global" flags that track which endings have been reached. Flag values can be changed at any time by left- or right-clicking the numbers. Now that the game is fully translated and everyone's had an accidental preview, I'm officially releasing the Fate/stay night Debug Patch. I discovered the "test play" mode while investigating FlowChartLayer.tjs shortly before UBW was released, made a quick patch to enable it, and sent it to the Mirror Moon team to make HF beta-testing easier (and hopefully faster). Since then, I've managed to get everything to display in English - flag conditions, pop-up messages, flag names, route/day names, etc. I also extended the time that debug pop-up messages are shown, because it's not easy to read "(Sakura_Route is NOT LESS than 1? -> NO!) AND (Sakura_Point is NOT LESS than 1? -> YES!)" in 1 second. "テストプレイ用のツールを使う" is roughly "Use of play-testing tool." One character was deleted to un-comment the line. I'm surprised I was the first to find this, I can't find any Japanese sites mentioning it either. Last edited by Kapow on January 1st, 2013, 1:24 am, edited 5 times in total. Hi guys. Sorry about the flowchart goof. Special props goes to Kapow for showing me where to enable the internal flowchart. It was extremely useful during the beta testing and made things progress quickly. ArchDemon wrote: Hi guys. Sorry about the flowchart goof. Special props goes to Kapow for showing me where to enable the internal flowchart. It was extremely useful during the beta testing and made things progress quickly. Personally, I think that the internal flowchart is a rather useful and convenient tool. I guess having that opion helps in the game in case you want to see a certain Tiger Dojo, or even want to get a certain ending without trying to look at which answer is the right one or not. No, you should run the fix and then add the patch in this thread. 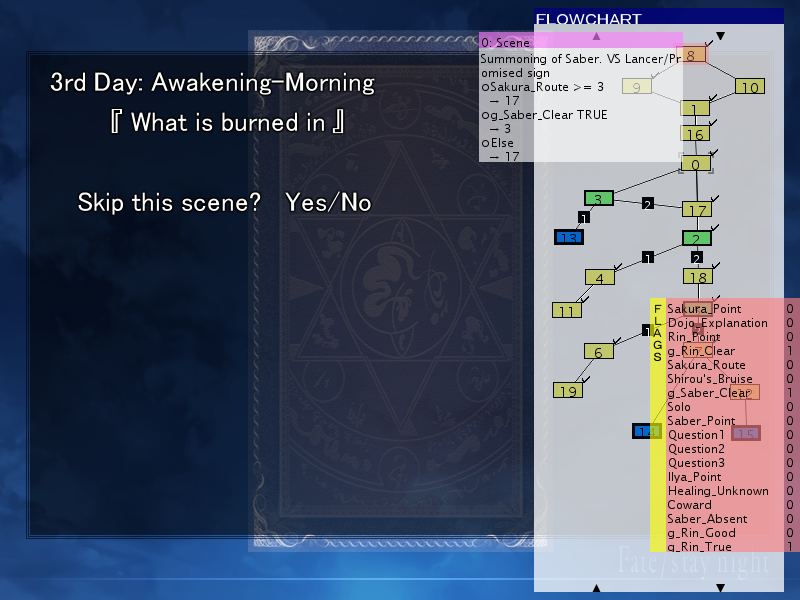 It works along with the MM patch, and shows the flowchart in English. Meaning.. Can i 'hide' the flowchart from not appearing when i decided that i dont wanna follow it from time to time? You can right-click it to slide it closed, but it'll still show as a tab in the corner. If you want it gone completely, you could rename the patch file so the game doesn't load it, like "__patch7.xp3". Do these flags carry over if you want to change your decisions later on? So far within the flow chart provided I can go and up my Sakura Points but there's a point where I can also talk to Illya since my Sakura points were sufficient but I was already at my 7th day when I decided to up my convo points with Illya. Does it carry over when i replay some parts? Awesome little patch BTW. Makes it easier to know what I have or not. I'm not sure what you're asking. Loading a saved game will load the flag values from the save. The flag values won't change if you use the flowchart to jump to another scene. A scene that causes a flag change will trigger it as the scene ends, so jumping out of that scene will skip the change. You can change the flag values manually by left/right-clicking the numbers, but I'd recommend trying to get the flags you need by reading/skipping through the scenes normally, to make sure you haven't missed part of the story. All right, will keep that in mind. Thanks for that. I think it's worth mentioning that in addition to being a flowchart and able to check and change different flags in-game, you can double-click on a scene to jump to it, regardless of flags or your previous position. I didn't realise this until I was halfway through UBW, and up to that point I was trying really hard to make sure that I played through each and every scene in the game, which took me an extremely long time. Finding this out made it much easier for me. So what exactly does this patch fix? It doesn't fix anything - it puts the game into debug mode, making it possible to jump to any scene, change stats, etc. Not the best way to enjoy the game for the first time, but fun to play around with. Yes! Thanks for this. The game is freaking epic!